Prostate cancer patients may soon have a new option in treating their disease: laser heat. Researchers at UCLA have discovered a new way to treat the disease without the risk of side effects such as erectile dysfunction and urinary incontinence. 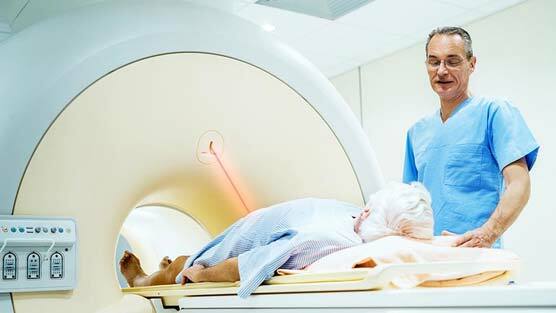 The laser technique, known as MRI-guided focal laser ablation, uses magnetic resonance imaging (MRI) to guide the insertion of a laser fibre into cancerous tumours. When heated, the laser destroys the cancerous tissue. The study, reported in the Journal of Urology, found the treatment was “both feasible and safe in men with intermediate risk prostate cancer”. Typically, prostate cancer has been treated with surgery and radiation, which can often result in serious side effects. The new study provides proof of principle that laser ablation can be done safely and effectively with MRI. In this case, eight men underwent ablation while in an MRI machine. Researchers found no serious adverse effects or changes in urinary or sexual function in patients six months following the procedure, but stated that longer-term follow-up is needed, as is a continued assessment of appropriate treatment margins to ensure cure. “This focal therapy provides a middle ground for men to choose between radical prostatectomy and active surveillance, between doing nothing and losing the prostate. This is a new and exciting concept for prostate cancer treatment”. A follow-up study, presented in a poster presentation at the American Urology Association meeting in May, showed the potential to transfer this treatment for the first time into a clinic setting, using a special device (Artemis) that combines both MRI and ultrasound for real-time imaging. If the laser technique, known as MRI-guided focal laser ablation, proves effective in further studies — especially using the new MRI-ultrasound fusion machine — it could improve treatment options and outcomes for men treated for such cancers, said study senior author Dr. Leonard Marks. The laser treatment has yet to be approved for use in prostate cancer by the US Food and Drug Administration.